So which brake pads right for you ? just click on the image below and watch the video.. Brake pads and discs…we all have them on our vehicles and when they need upgrading or even replacing its worth stopping for a minute and considering one of our upgrade combinations. And please dont hesitate to contact us if you need assistance in this area because brakes are a funny thing…theres alot of “feel” thats either right or worng for you…so its important to get it right. e.g Theres no point opting for a race pad because you car has loads of power when used on the road because these pads need heat in them before they work…great on the track…horrible on the road. 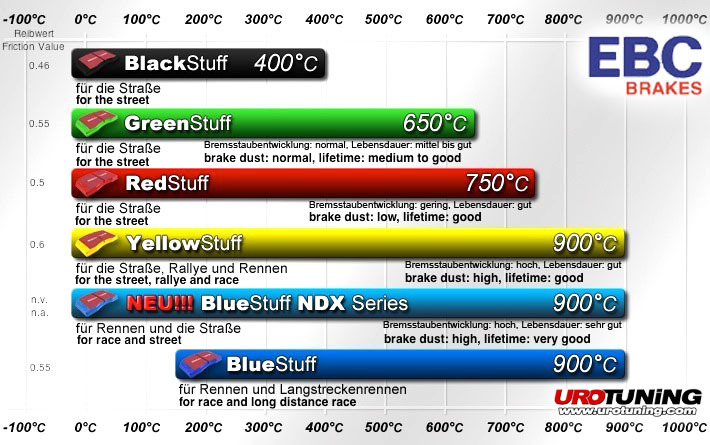 We have been using EBC brake pads and discs since they first started and have always found them to be superb…so here,s some information that should help you…but always call us if you need some additional help..
Pads can make a massive improvement to your vehicles braking ability and dont be put off by some of the more extreme options such as the yellow stuff pads which are superb on many road vehicles with great cold bite and outstanding braking power. Brake pads and discs are all about recipes. With the discs its the friction quality of the discs that really counts…and in particular the carbon content which wil;l give you a better initial bite and noticeable improvements in braking power. Cross drilling or grooving all help in removing brake pads gases when the pads and discs are actually in contact during heavy braking situation and again all go to improve brakes power and consistency..